Control A Dog By Using A Spot Light Source! Home / Computers/technology / News / Control A Dog By Using A Spot Light Source! Researchers in Japan have now created a harness which can remotely control dogs without using any invasive technology. The operator can navigate canines who have training, from starting positions to different goal positions, by changing the direction of spotlights on the canine suits. The canine can pass the narrow space like a door and walkway and take a photo of target objects. 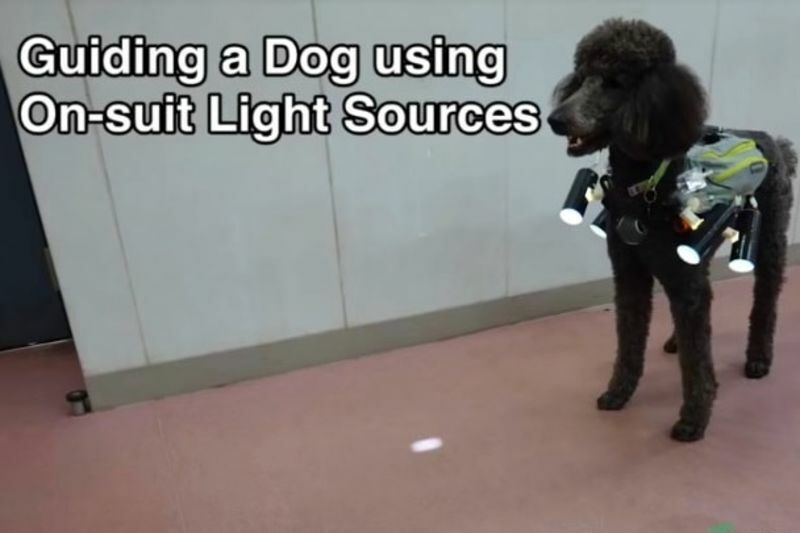 In this video by "ImPACT Tough Robotics Challenge" the dog is fitted with a vest that has 'on-suit light sources,' which shine on the ground in the direction it should go. This was done by using the remote-controlled system. The dog moved between the desks to arrive at the target location by following the light stimulation which was specified by the operator. The smart vest is equipped with a handful of flashlights, which also carries a camera that shows the view from the dog's perspective, allowing the person in charge to see what the dog is seeing as it navigates the space. Why Not Create Your Own WhatsApp Stickers?